Saint Bernardine of Siena, Priest - My Catholic Life! Saint Bernardine of Siena was the Billy Graham of his day. Graham was a well-known American evangelist who traveled ceaselessly from city to city preaching the good news of the Gospel over many decades. Yet while today’s saint was certainly a roving evangelist, he was also much more. He was first and foremost vowed to poverty, chastity, and obedience as a Franciscan Friar. Saint Bernardine was also ordained into the one Priesthood of Jesus Christ by a successor of the Apostles. And he had received a long and complete theological and humanistic education before he ever opened his mouth in front of a crowd. He was even a doctor of canon law. Fifteenth-century Italy was hot with reform of the Church. Ever since 1417 and the end of the Great Schism (an era of two and even three competing popes), talk of Church reform was on the lips of anyone who believed enough to care. Unfortunately, every effort to compel a bishop to live in his diocese, to form better educated priests, to purify indulgence selling, to streamline Church courts, to appoint holy bishops, to stop commerce in relics, and so on, was ignored or resisted. The roots of some weeds are tangled and ferocious. They cannot be pulled from the ground. The 1400s were a lost century for efforts to reform the Church. The popes tightened their grip on Church power so that no council would ever pry their fingers from the levers of ecclesial governance. The needed reforms would have to wait until the immensely successful Council of Trent in the mid-sixteenth century. But it was too late by then. Father Martin Luther and others had been tired of waiting. The Reformation began in 1517, one hundred years after the Great Schism ended. Vast populations of Northern Europe were cleaved from the true Faith because the needed reforms came too late. Saint Bernardine of Siena was one of the many bright lights of fifteenth-century Italy who did everything in his power to create a holier Church through his preaching and witness. He was such a thoroughly compelling and entertaining speaker that enormous crowds turned out to hear him, normally first thing in the morning. He encouraged devotion to the Holy Name of Jesus and often held the IHS monogram in his hand when preaching. This devotion was later incorporated as a feast day into the universal calendar of the Church. Bernardine dramatically exhorted his congregations to melt their mirrors, playing cards, perfumes, dice, wigs, and other worldly distractions in a “bonfire of the vanities” roaring near his pulpit. This was true drama. In the Franciscan tradition, Bernardine of Siena walked everywhere. No horse or mule or carriage for the journey. He excoriated usury, superstition, and the deplorable scourge of homosexual acts, in the starkest terms. 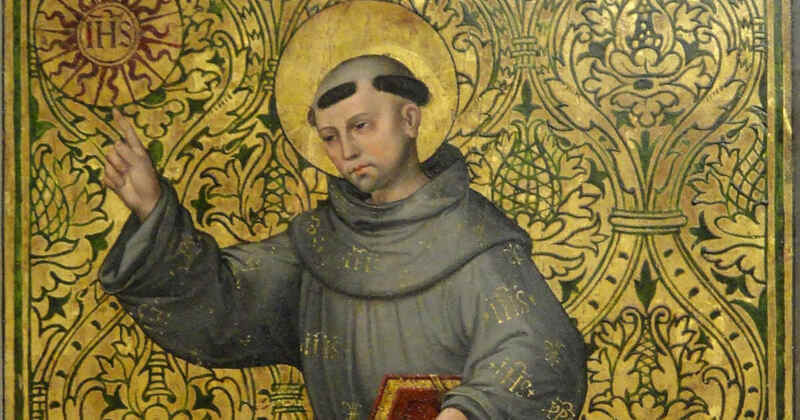 Compared to the modern penchant for market research, polling, and tailoring a message to audience expectations, Saint Bernardine was fearless. He spoke the unvarnished truths of his religion to the adherents of the same. Preaching, he understood, was an essential charism of the Priesthood of Christ, not an add-on. Saint Bernardine also published, far ahead of his time, works on entrepreneurship, business practices, a just wage, and the determining of just values for a product or service. Saint Bernardine was a sophisticated thinker with a common touch. 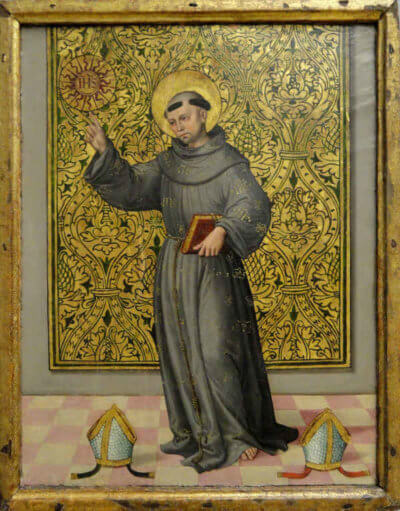 The fact that Saint Bernardine lived almost to the dawn of the age of the printed book meant that many of his sermons and works were accurately preserved. It also meant that images of his likeness were uniform and accurate. A famous painting by El Greco shows the emaciated friar in a worn franciscan habit, the three knots on his white cincture visible, representing poverty, chastity, and obedience. His right hand holds a standard bearing the monogram of the name of Jesus—IHS. In his left hand is a book, perhaps the Bible. And at his feet are three bishops’ miters, resting on the ground. Saint Bernardine was three times offered to be made a bishop by the Holy See. And three times he said, “No.” Thus, in addition to all of his other considerable virtues, our saint also possessed the queen of the virtues as well—humility. No bishopric for him. Bernardine of Siena was the Saint Paul of his era and was canonized in 1450, just six years after he died, numerous miracles having already been attributed to his intercession. Saint Bernardine of Siena, inspire all preachers to not count the personal cost of stating uncomfortable truths but instead to suffer the repercussions of honest talk. Help priests to fortify their preaching with impeccable lives of prayer, fasting, devotion, and virtue, just as you did.